Two-part absorbency system is available in three levels of protection. Contoured shape, padded wing areas, and elastic leg gathers provide effective and convenient protection for ambulatory residents. 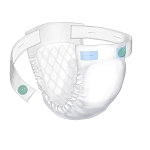 Pads are designed to be worn either with the Simplicity Mesh Pants or similar control undergarments. Contains super-absorbent polymer for maximum fluid retention while reducing odor and keeping wetness away from skin.